my sister is coming home tonight and in celebration, i baked these little beauties. they are as delish as they are pretty, too. Preheat the oven to 350 degrees F. Line 1 (12-cup) muffin tin with 12 paper muffin-tin liners and place 4 paper muffin-tin liners inside another muffin tin. Add 2 tablespoons of water to each of the paperless muffin wells. In the bowl of an electric mixer, combine the flour, sugar, cocoa powder, baking soda, and salt. Add the remaining ingredients, adding the hot water last. Beat with an electric mixer until smooth. Divide the batter evenly among the paper muffin-tin liners. In a small bowl, beat the cream cheese with the sugar. Fold in the coconut. Drop the cream cheese mixture into the center of the cupcakes. Bake for 20 minutes, until the cupcakes rise and a toothpick inserted into the center comes out clean. 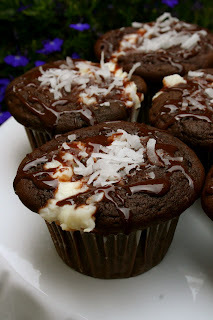 Drizzle chocolate sauce over cupcakes when serving.